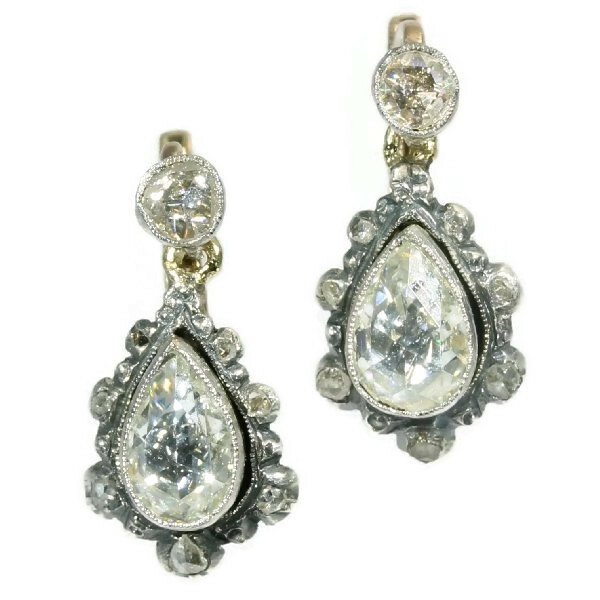 Antique rose cut diamond earrings pear shaped: Description by Adin Antique Jewelry. From each of these Victorian hanging earrings with an 18K yellow gold back and a silver front, a grand pear-shaped rose cut diamond set in foil lustres from its halo of eight rose cut diamonds. As every diamond in this jewel from 1870 gets to shimmer from its rose cut diamond suspension, so grants this timeless piece of jewellery any lady the same opportunity to shine. Diamonds: Two big pear shaped rose cut diamonds and 16 smaller rose cut diamonds. We do not have the weight of the diamonds which is normal in our trade when it comes to rose cuts.